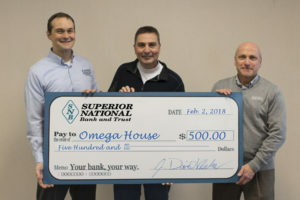 The employees of Superior National Bank voluntarily contribute to a “Casual for a Cause Fund”, wearing bank apparel on Fridays to support local causes for the community. Omega House was chosen by the employees to receive these most recent funds. Thank you SNB employees. Our Mission at Omega House is to provide a home-like environment where people at the end of life may live fully, receiving compassionate and competent care from professional, volunteer and family caregivers. Omega House also offers respite care services and advance care planning discussions. For more information on Omega House and the services offered, please call us at (906) 482-4438. In its first full year of the Omega House Caring Hands Massage Therapy Program, residents have received 164 massages. Asked for feedback, 94% of those treated had positive comments – 73 residents felt more relaxed, and 5 said their pain had actually decreased. To ensure the program continues, we have established a Massage Therapy Fund, where your donations will help our Caring Hands program. To donate, go to our website, click on Donate and fill in the information. In the “Comments” box at the bottom of the page, write “Caring Hands Massage Therapy Program.” Your donation will go directly to our House Coordinator, Mary Kay Grabig. To be a community leader and resource for end of life care issues.